Vintage Baseball Glove Forum • View topic - PM CUSTOM GLOVES? Anyone bought one of these gloves? I am strictly a Big 3 glove guy ( rawlings, wilson, mizuno) but these look alright. Just curious if anyone has seen one of these or purchased one? We have a huge list of options for the customization of the gloves. From the color of the skin, stripes, welting, stitching, etc... to even the option of hammering the glove and have it ready to play when you get it in your hands. And some other attractive options as the possibility of including your country flag. Our gloves are made with top of the line leather ( Steer Hide and Kip Leather ) comparing them with any big brand on the market today like the ones you mention before. We have several player on the minors wearing our gloves already and we have had nothing but good feedback from them. There is a section on our website it's called "TESTIMONIALS". On that section we'll be adding anybody that bought a glove from us and sent us there picture. Pros and just regular fans and players, in Promound we treat everybody as equal and for that reason we though having something like that it would be nice. You can check the website for more information and you'll see all the options possible on every different glove. They look like they made in Taiwan. I will bet they are coming from the same production line as NV, Valle, and others. They should have copied NV or Valle's order form because theirs is terrible. It is getting easier to start a glove company, thanks to Alibaba, since you no longer have to develop patterns. Of course creating that new label is probably not as easy as it sounds, or maybe it is. For me the big three will always be Rawlings, Wilson & Spalding (with little brother MacGregor). "what the world needs now, is glove, sweet glove..."
granted they do "feel" nice when you slip your hand into it, but do they have the feel and durability of the old schoolers? Asthetically speaking, I think the PM is a really nice-looking glove. Especially with the number of options you can pick from - from logo color, to the stripes (interesting), and the web designs, I can see how somebody might want to deck one out and display it on a shelf. And I'm sure for the majority of us, it'd be more than acceptable to play catch with, or use it in an occasional game. But if I was fortunate enough to make a living playing baseball, would I use a PM over, say, any of my HOHs or A2000s? Probably not, but that's just me. But how much of my opinion biased because of the logo on the wrist or the stamping on the palm? For me personally, I'm not sure. I'm mainly a Big 2 (Rawlings and Wilson) guy myself, but I'd also like to know how these new gloves fare against the old tried-and-true. Is there any sort of objective and unbiased testing system where we can rate these gloves - like a Pepsi Challenge with baseball gloves? I mean, think if we had a pile of similar gloves, all stripped of logos, dates codes - everything that would enable us to attribute any glove to a particular maker. Then we'd break them in identically, play with them, abuse them, then rate them, head to head, top to bottom...I wonder how that would play out? A Pepsi Challenge with this board would be tough on the new guys; most every one around here is pulling for Goliath. I think the new gloves would perform ok it is not like they are from new manufactures just a couple companies rebadging the same basic gloves and trying to sell them in the USA. I don't own a PM glove, but I do have a Valle glove and it is terrific. The leather is really nice and the craftsmanship is first rate. If bs is correct in his speculation that PM and Valle gloves are made on the same line, then these are really well made, quality gloves. I am a big fan of the USA Made Rawlings HOH gloves of yesteryear, but I also think that there are a lot of first rate gloves that are not made by Rawlings, Wilson or Mizuno (Akadema comes to mind). While I own a lot of gloves, I think I'm like many collectors here who see a glove as a tool for playing baseball first and as an object to put on your shelf second. I finally got around to looking at PM's website due to a rainbow colored glove showing up on e-Bay. Their patterns are similar to Rawlings and their webs appeared to be inspired by Mizuno or Japanese made Rawlings gloves. I do like the Pro-I web with the modified trap style lacing (1858). I also like the custom embroidering they do such as the Air Force and Army logos and the dual flags. 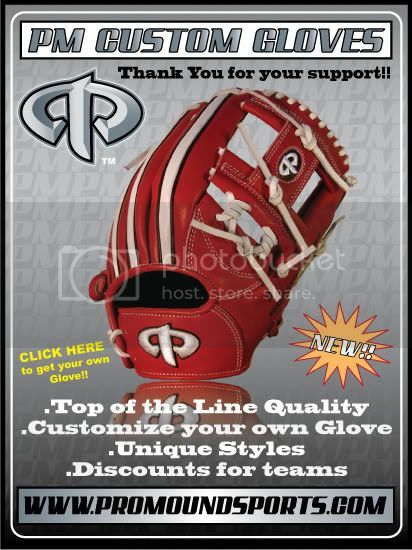 I will always be a Rawlings guy but I may give them a try since they have "borrowed" their patterns from Rawlings. Has anyone tried these gloves yet? I know most guys on here like the feel of the older HOH USA gloves as their primary choice. Not too many newer gloves are similar to these. I will say that the closest I've found to one of my USA HOH gloves was a ROLIN glove that I picked up a few months ago.Very nice leather, and even when broken in still had a good amount of firmness left in it. I would love to try on one of the PM gloves just to see what they are like. I find it interesting to see how all the different gloves feel /compare in quality etc.